The activities themselves are sort of a mix between learning and physical action. One activity has you picking out various outfits for characters; you're instructed to choose specific outfits for a character based on theme or color. You might help weed a garden, plant and water seed, reach for stars, or dance with the on screen characters. All the activities held my two year old's interest quite well, though some seemed to go on a little long for my taste. In a few instances you’ll be asked to mimic a flapping motion to make the characters fly, during which you need to lean and direct your character to collect items. Doing so gives yourself gusts of air to rest - it's both incentive and necessary. The on screen characters, my daughter and daddy all commented on how tired our arms got! This is almost like excercise I thought. There seems to be plenty of content throughout the game as well, and the later stories do build on some of the gameplay mechanics from the earlier one. Each story lasts a few pages with various activities and almost all end in a dance number. Another nice thing i noticed about the game is that the motion sensing is pretty forgiving. You don’t have to mimic the actions as accurately as say, Dance Central 2 might require. This means your child will be getting plenty of positive reinforcement from the game (and from Daddy) when you complete objectives. I never really saw my daughter get frustrated because she was doing something and the game wasn’t responding, save for one action which required her to put both arms forward. Aside from motion controls, Once Upon a Monster does utilize some voice controls as well, though it’s for simple actions like yelling Happy Birthday to Marco at his party. I would have loved to see a little more interaction here with the kids talking to the on screen characters - my daughter was definitely eager to interact with them - waving at Cookie Monster every chance she got and saying hello. Once Upon a Monster utilizes a system of gaining stars to gauge just how well you are doing. Every page in the story book earns you a maximum of five stars and at any time you can page back through past activities and try to do better in them. This gives both you and your child some incentive to go back and play previous segments over again, though my daughter wanted to dance with Grover...over..and over again without even understanding what the stars meant. 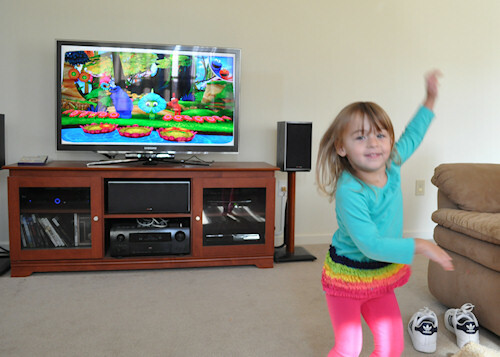 It’s easy to see the possibies that Once Upon a Monster has laid out with the first Kinect game geared towards toddlers. It’s simple, fun, and intelligent for kids while still mainting entertainment value for adults. Numerous times I laughed out loud at the dialog and character reactions, it’s a very well written game. While I think my daughter might have been a hair too young to get the most out of the game, she still had a ton of fun playing with daddy. If your child is in pre-school Once Upon a Monster is a perfect fit for co-op gaming, learning and entertainment. The Co-Op Experience: Play through a series of small stories featuring characters from Sesame Street. Each is story features different motion controlled mini games. You can drop in and out at any time simply by walking on and off camera. Page created in 0.4359 seconds.